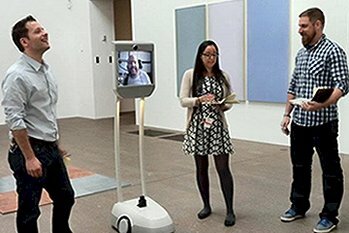 San Francisco – Where patrons with disabilities that prevent them from visiting the de Young in person can now visit the museum remotely with by using a computer with a camera and a Wi-Fi connection. T he new Beam Tour program uses an ambulatory device known as BeamPro, generously provided to the Fine Arts Museums by its maker, Suitable Technologies, and allows for an independent and interactive user experience. The device’s sensitive lenses allow the offsite visitor to see the art in high resolution, while its microphone, screen, and speakers enable interaction in real time with guides or friends in the museum. See Beam in the CBS New segment “Robots open up the world of art”.